Sharwanand comes with another comedy entertainer under the direction of Chandra Mohan. Sharwanand is in continuous success with his two previous films. The apt role of Sharwanand in this film picks the pace of the film. After a award winning film, Shatamanam Bhavathi, Sharwanand’s next film is a mass entertainer which completely goes on comedy with a little action. The movie has been directed by a debutant Chandra Mohan and is depicted to be a mass entertainer in the trailer. Sharwanand is playing the role of a cop and Lavanya Tripathi played the female lead in the movie. The makers unveiled the theatrical trailer of Radha today which is thoroughly entertaining. Sharwanand essayed the massest role in his career till date. Looks like May 12th will turn out to be a totally entertaining day as Radha is all set for a grand release. Sharwanand is one of the hearthrobs in Tollywood right now and not to forget, he is an eligible bachelor too. The trailer is absolutely fantastic and we can promise that you would want to watch it multiple times without any doubt. Directed by Chandra Mohan, Radha is touted to be an action packed family entertainer. 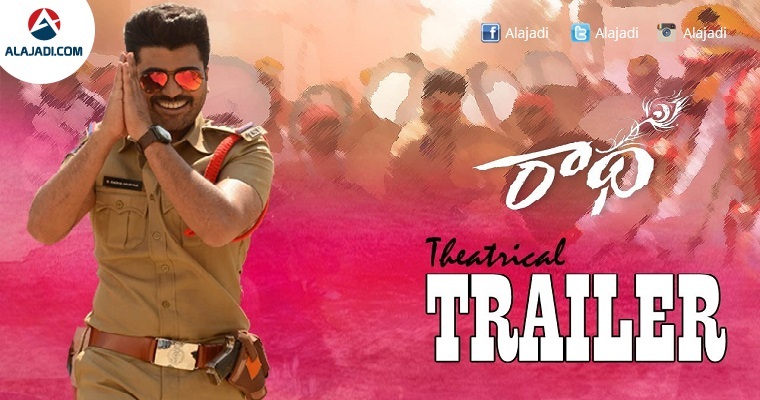 It is expected to be a perfect summer treat for all cinema lovers and Sharwanand fans. Radha is a production venture of Bhogavalli Bapineedu under his home banner Sri Venkateswara Cine Chitra. The movie is being presented by BVSN Prasad and the music is rendered by Radhan. The background score itself proves, the movie will have an exceptional set of songs. Radha stars noted actors like Jayaprakash Reddy, Kota Srinivasa Rao, Tanikella Bharani, Brahmaji, Pragathi, Ravi Kishan, Ashish Vidhyarthi and others in pivotal roles. Mark the date in your calenders! Radha is on it’s way!